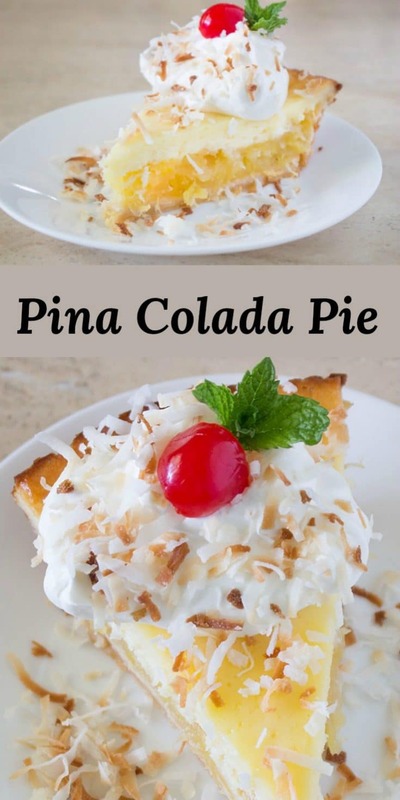 Pina Colada Pie is a perfect tropical dessert. Coconut cheesecake baked on top of a pineapple pie all in a shortbread crust then topped with coconut whipped cream and toasted coconut. Pina Colada Pie is in the regular dessert rotation at my house. It is a newer recipe and not one that I have lugged around for years or anything. It actually turned up in my life when asked me to make this for her. Being who I am, I bought the stuff for it during my next trip to the grocery store. As time went on, I forgot about the recipe. I stumbled over the cream of coconut in the pantry and remembered why I had it and why it was sitting on top of a package of a package of store-bought cookies. I doubled the pineapple layer by sheer accident the first time I made it. I have to admit I didn’t know crushed pineapple came in anything smaller than a 20 ounce can, but that’s what I had already dumped into the pan, so I doubled the sugar and cornstarch. It turned out just fine and we have decided that we actually like the extra pineapple. 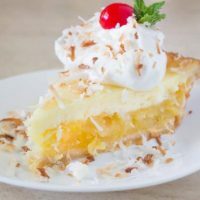 There is just enough of a cheesecake flavor that can tell you are eating it, but it isn’t so overpowering that it knocks out the tropical flavors this pie delivers. It is a pina colada pie after all. If you don’t like extra pineapple, but all means, use an 8-ounce can and half of the other pineapple layer ingredients. The original recipe by Southern Living is written that way to start with. Don’t be intimidated by any of the ingredients or the fact that it has 2 layers. It takes a bit of time to make, but I assure you, it is simple. You can skip the homemade coconut whipped cream if you prefer. 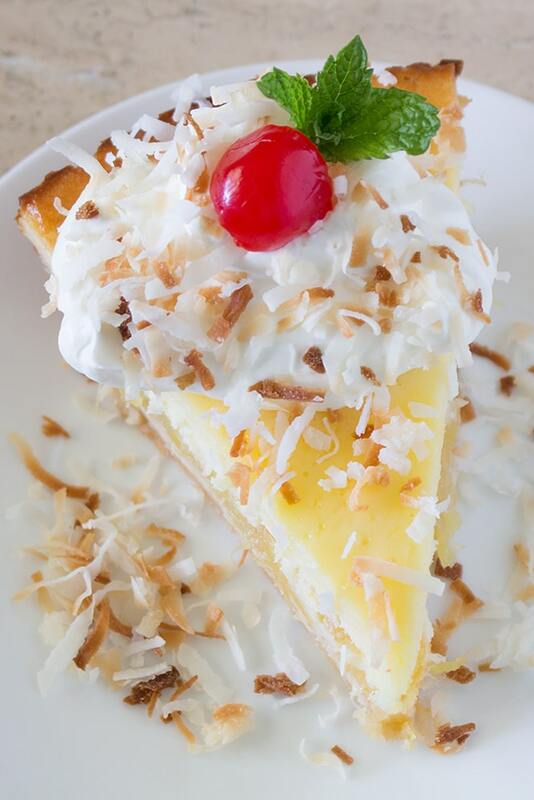 We like extra whipped cream and toasted coconut on ours though. Feel free to send all the extra our way. Remember to follow us on social media using the buttons at the bottom of this page and if you have tried this recipe or any of our recipes, show us some love by leaving a comment and rating the recipe. Pina Colada Pie is a perfect blend of pineapple and coconut in a shortbread coconut crust. Spray a deep dish pie pan with baking spray and set aside. Crush cookies in fine crumbs using a food processor or by crushing with a rolling pin while cookies are inside a zipped baggie. If someone eats 2 or 3 cookies, it’s OK. Combine cookie crumbs, coconut, and melted butter into a small bowl and mix to combine. Place crumb mixture into pie pan and press mixture evenly on the bottom of the pan as well as up the sides. Remove and set aside until completely cooled. In a small saucepan add undrained pineapple, white sugar, and cornstarch. Mix well until no lumps of cornstarch remain. Bring mixture to a boil, using medium-high heat. Boil for 1 minute or until mixture has thickened. Remove from heat and set aside until completely cooled. Add 1 cup cream of coconut and mix well. Add eggs and beat until everything is well incorporated. Retrieve pie crust and add pineapple mixture to the bottom of the crust. Carefully add cream cheese mixture on top of the pineapple, spread to edges of the pie. Bake in preheated oven for 35 to 45 minutes or until cream cheese mixture is set. Remove from oven and cool for at least an hour, then transfer to refrigerator for at least 4 hours. When ready to serve, prepare whipped cream topping by combining 1 cup of heavy cream, 1/2 cup of cream of coconut and 1/4 cup of powdered sugar. Beat until light and fluffy. 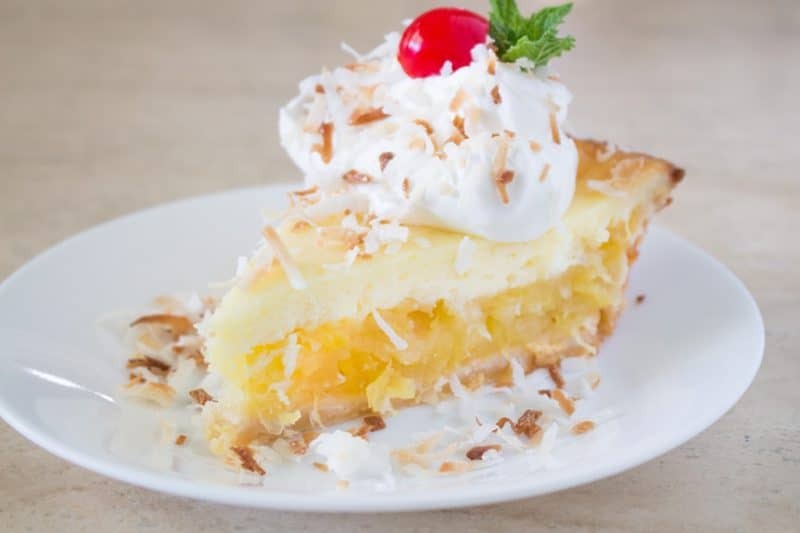 Place a dollop of whipped cream on each piece of pie after it’s plated and sprinkle with toasted coconut, this keeps the toasted coconut crunchy and keeps your whipped cream from deflating and making your pie ugly. Save left over whipped topping in a separate bowl and rewhip if necessary when serving left over pie.